Home Opinions Preparing For Elections 2019 Or Stoking Caste Wars? New Delhi: Right from the time Mr. Narendra Modi has ascended to the prime minister’s chair in the historic 2014 elections and the Congress’ near decimation, politics in India has witnessed one abysmal low after other. Just like other right thinking and educated Indians, whenever I thought things couldn’t get worse than this, politicians manage to surpass themselves each time. Everyone whom I talk to agrees with me that Mr. Modi is the most charismatic leader India has got in a long long time. Knowing him to be a doer and believing him to be able to solve their problems, people placed their faith in him in 2014. The so-called opposition couldn’t digest the fact that power has been yanked from below their feet and they were in political wilderness. They could not accept the fact that a person whom they denigrated as a demon, mass killer, maut ka saudagar et el was at the helm of affairs. More so they were aghast that the general populace of India was not listening to their drivel and rather was in the thralls of a Modi mania. The Modi wave continues to sweep them out of power in state after state barring some like Delhi or Punjab. The Modi haters got their best chance in Gujarat where BJP was staring at a huge anti-incumbency factor, Patidars on warpath and Congress was banking on the three so called ‘young leaders’ but here too, they were bested by Modi wave. It is true that the BJP’s margin was decreased but then this was a state election. The issues in a general election are different and in 2019, the role of Gujarati asmita is bound to come into play. The preparations for 2019 have begun in right earnest. The BJP, under the Narendra Modi-Amit Shah duo, is now a well-oiled political juggernaut which is always in an election fighting mode. As soon as an election is over, they immediately switch over to the next due elections. There is no time for wild political celebrations. After the Gujarat results were announced, the PM was in the Northeast while Amit Shah was busy preparing the groundwork, huddled with his team. At the same time, preparations of the principal opposition party Congress and its acolytes are a bit different. They witness an absent intolerance; they look at everything from the prism of impending caste wars and don’t have any qualms at taking even the minutest help from people who raised slogans like “Bharat tere tukde honge”. This was witnessed just before the Bihar elections as well when the Award Waapsi gang came out in full force against the ruling dispensation at the centre. 2018 began on an ominous note for Maharashtra. 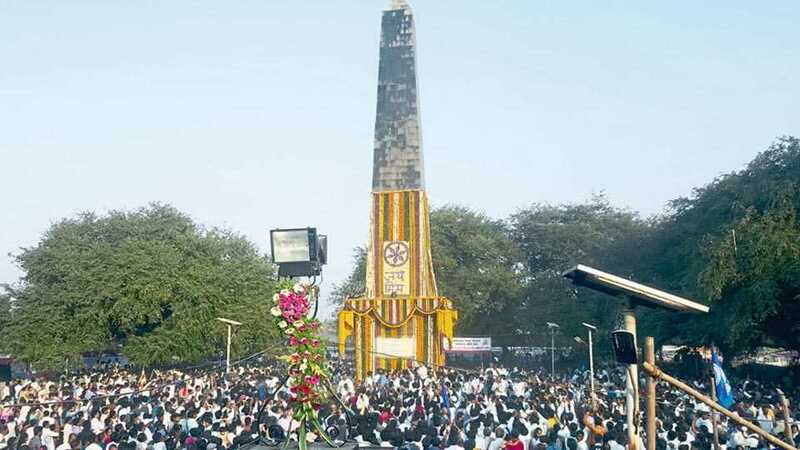 The Dalits had assembled in large numbers at Bhima Koregaon near Pune on January 1 to commemorate the second centenary of the battle between the forces of Peshwa Bajirao II and the British East India Company. Violent Dalit-Maratha clashes broke out in nearby villages. Grabbing the opportunity to establish his leadership clout, Prakash Ambedkar, the president of Bharatiya Republican Party Bahujan Maha Sangh called for a bandh on January 3 to protest these clashes. If we look at the history of the Bhima Koregaon battle, we find that a large force of the Peshwa clashed against a relatively small British contingent. Though the battle ended without any one clear winner, the resilience with which the British contingent faced the Peshwa might was a victory in itself. Some historians have different opinions about this fight. Some believe that the Mahars defeated the Marathas but not the Brahmins while many others view it as simply an Anglo Maratha battle. The British could overcome the challenge due to the extraordinary valour and courage displayed by the soldiers of the then “untouchable” Mahar caste in their ranks. The British erected a victory pillar at the site, on which the names of 49 dead soldiers, including 22 Mahars, were inscribed. This pillar in later years became a powerful symbol of Mahar pride and today, in the Dalit narrative, is a monument to community assertion and self-respect. But we need to try and understand why this community affair which went off peacefully every year without any controversy morphed into violence. According to a top official with the Maharashtra home department, the violent Dalit protests was not a spontaneous reaction to the attacks on the community members but was the fallout of a trap systematically laid by the extreme left wing organisations in which both the Dalits and the Marathas were caught unaware. So it is being tried to cloak Bhima Koregaon as a form of caste war where the Dalits battle to demolish the Brahmin Peshwa and the caste system. It is a weird claim because in the real battle, if the Mahars from the British side then the Peshwa advance party had mostly Arab Muslim soldiers. So, wouldn’t it be fairer to call it a Dalit-Muslim battle? Or shouldn’t it be called what it actually was? It was an Anglo-Maratha battle in which soldiers from Mahar, Maratha and other castes fought from the British side while the Peshwa army had Marathas, Muslims, Gosain, Mahar and other caste groupings, even the Portuguese. If the Mahars fighting on the side of the British make it a social justice battle of the Dalits against the Peshwas then the Dalit castes such as Matang, Mang and others on the side of the Peshwas make it a national battle of the Dalits against the British? But the opposition parties, wishing to corner BJP on the issue, are hell bent on pinning the blame on the ruling party. The CPI (M), which is looking to rebuild in Maharashtra, lent active support to the bandh. The leaders of the Congress and the NCP projected the agitation as a handiwork of divisive communal forces and at the same time, blamed the Devendra Fadnavis government for failing to anticipate and prevent violence. At the same time, Prakash Ambedkar, the grandson of Dr. B R Ambedkar, tried to project himself as a pan-Maharashtra leader as his clout had been, so far, limited to the Vidarbha region. The government, on its part, blamed outside elements for triggering unrest while senior BJP and RSS leaders put the blame on newly elected Gujarat MLA Jignesh Mevani and JNU student Umar Khalid. Incidentally Mevani could win only when the Congress withdrew its candidate from his constituency. As for Khalid, the less said the better. Such illogical situations emerge when it is tried to cloak history in present day politics. It is a fact that the Dalits were in a pitiable condition in the Peshwa feudal rule where the Peshwas were the upholders of a regressive social order in which the Dalits and the other untouchables bore the brunt. But to say that Dalits entered the British service as a means to attain their freedom is a cry in vain. The British armies had even larger number of Rajputs and Brahmins in their ranks then what kind of freedom were they aiming at? The fact is that the British wanted troops for themselves and were least bothered as to which caste of religious grouping they came from. After the first war of independence in 1857, the British began to ignore the Mahars and the entry of the Dalits into the British army was completely banned in 1892. This ban was lifted when the British army was thinly spread in World War I and foot soldiers were needed in large numbers. After the war was over, the ban was again enforced. The British were only interested commercial enrichment of the mother country and not in ensuring social justice for any suppressed caste or class as is being falsely propagated. Then why did controversy and violence erupt this time around? If we look at it carefully, we see a special kind of pattern emerging and that is of demanding reservation. The Jats came on to the streets in Haryana and western UP while the Gurjars and the Rajputs did the same in Rajasthan. The Patidar community took the cue in Gujarat and tormented the BJP in the elections gone by. This significantly emboldened the Marathas who too have begun to demand reservation in government jobs. Now this clash with the Mahars is being harped upon to disturb the atmosphere in the state. The Lingayats are being instigated in Karnataka. As the BJP has a strong majority at the centre and has a government in most of the states, those outside the power structure are trying to find frivolous reasons to come together and challenge the establishment. In the run up to 2019, these types of experiments will be tried in other states where powerful communities and castes would be instigated to create an atmosphere and insecurity and efforts will be made to pin the blame on the BJP and the RSS. Last but not the least to say, many political dispensations firmly believe that the only way to stop the Modi wave and the BJP is to stoke ‘CASTE WARS’ across the country.